Canada’s architecture schools are in an unprecedented phase of growth and change. Enrollment in architecture programs is strong and new interdisciplinary programs are set to boost numbers further—in some cases doubling or tripling the size of the current architecture student bodies. Of the dozen universities that offer professional degrees, a third are planning or implementing major expansions. Another university hopes to start a new architecture program. All of these institutions share the aspiration to create new facilities in the downtown cores of their respective cities that reflect curriculum changes. 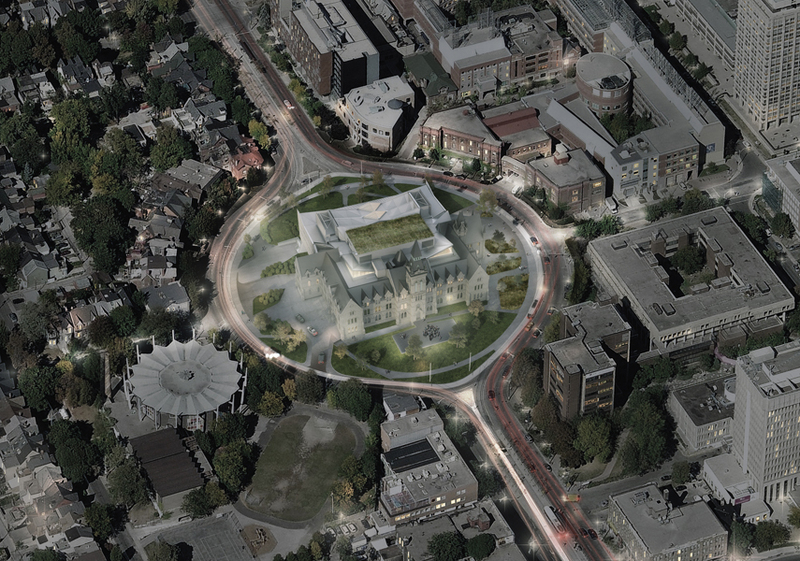 At the University of Toronto, a new complex underway at 1 Spadina Crescent is set to transform the John H. Daniels Faculty of Architecture, Landscape and Design. By the planned move in 2016, the faculty’s population will have tripled with the recent addition of undergraduate studies, the absorption of U of T’s programs in Visual Studies, and plans to initiate PhD and post-professional programs. The John H. Daniels Faculty of Architecture, Landscape and Design’s new home at One Spadina Crescent, currently under construction in Toronto, will more than double its existing space. The building project, which will vastly increase the size of current facilities, was enabled in part by donations from John and Myrna Daniels. The University has owned the former Presbyterian Knox College, located on a visually prominent site surrounded by a circular road, since the early 1970s. Over the past decades, it has suffered from benign neglect while housing a variety of programs. Boston- and New York City-based design firm NADAAA is charged with the renovation of the 19th-century Gothic Revival landmark, as well as creating a bold contemporary addition at the north end of the site and remaking the surrounding landscape and public realm. 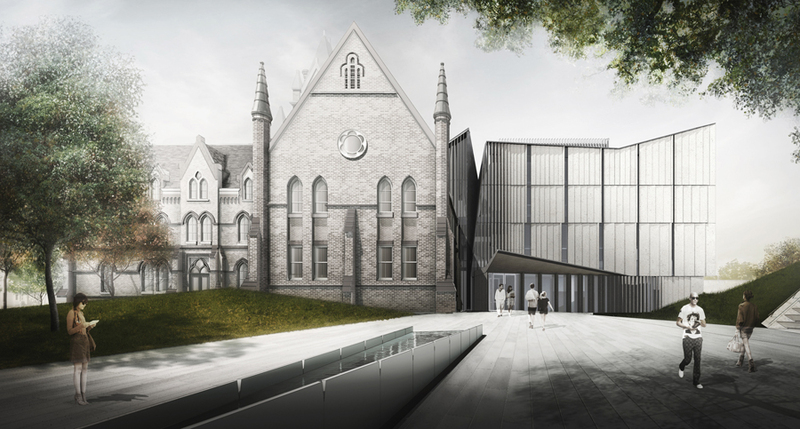 The One Spadina project combines the restoration of the existing Knox College with a new contemporary addition. The grad studio of One Spadina will boast a dramatic roof. 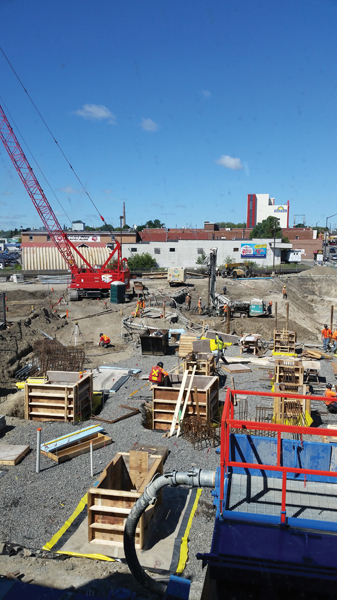 In Sudbury, a community initiative spurred the creation of a downtown design school that seeks to bring together disparate elements of the city and environs. Director Terrance Galvin was appointed by Laurentian University in 2011 to transform this vision into a concrete curriculum and space. In terms of curriculum, he looked to stitch together the potential construction applications of natural resources in the area with Francophone and First Nations cultures and a design-build education model. He imagined these manifested through a building that weaves historic structures with new spaces, and demonstrates the latest in sustainable construction. The new Laurentian School of Architecture includes a variety of fabrication workshops and research spaces. To create the new school, LGA Architectural Partners repurposed the masonry building that formerly housed the Canada Pacific Telegraph and a heavy timber farmers’ market (previously a train shed). Together, these marked a historic crossroads in Sudbury. The Telegraph building has been retrofitted with faculty offices and a boardroom, while its ground floor is rented to a restaurant and local internet service company. The former market currently contains studios and workshops, and during the summer, the community uses the large open space for local gatherings. 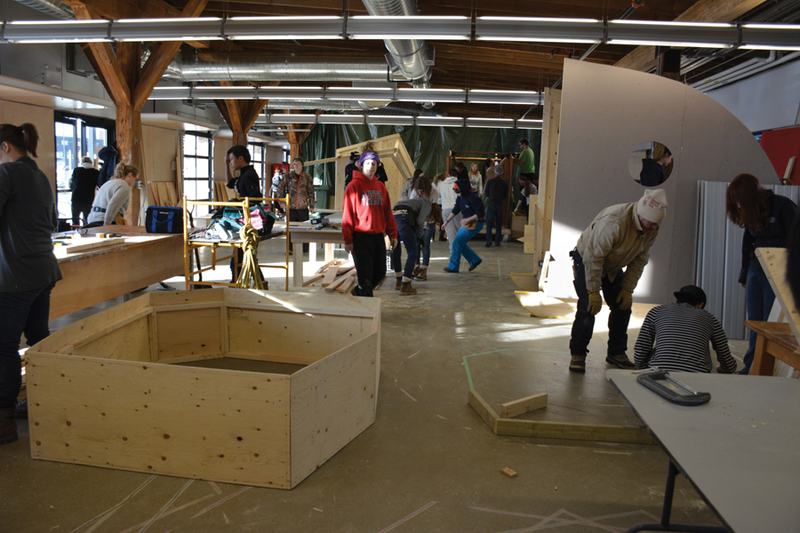 Further ties between the community and school are being fostered by initiatives such as including First Nations elders in design studio and theory courses, and auctioning off student-constructed ice-fishing huts to support a design-build fund. The arrival of students and faculty has begun to spur the creation of new shops, cafés, restaurants and student apartments in the downtown area. Construction is in progress for the next phase of the school. Two new buildings, also designed by LGA, will provide additional studio spaces, offices, a library and a student lounge. When this next construction phase is complete, the former market building will be converted to house digital fabrication areas, a metal shop, woodshop and wet labs for experimentation with traditional building methods such as rammed earth, adobe, and cobb construction. Next fall, students will design and build the round room that hinges between the historic and new constructions—a permanent link that embodies the school’s educational goals. Hands-on experience is integral to the program at Laurentian. At the University of British Columbia, the School of Architecture and Landscape Architecture (SALA) is also expanding its programs, with this fall’s launch of a new Master of Urban Design degree. The school also has plans to offer a dual Master of Architecture and Landscape Architecture, and to expand its undergraduate environmental design stream to a four-year program. To accommodate this growth, SALA plans to create two new facilities: a new building on campus and a smaller facility in downtown Vancouver. The new campus building will bring together Environmental Design, Architecture, Landscape Architecture and Urban Design—currently spread out over five different buildings—in a unified space for the first time. Says Director Leslie Van Duzer, it will underscore the “new curricular proposals that leverage exchange between these programs.” In the past, SALA had a downtown storefront studio, but it was shut down several years ago due to budgetary issues. The revived downtown outpost will be part of a new mixed-use development. And the search for a design team for the new facilities is imminent, with plans to announce the selection by the end of the academic year. Discussions about creating a new school of architecture at the University of Saskatchewan started four years ago, and the City of Saskatoon gifted a former John Deere Plow Co. warehouse to the University to house the proposed school. A critical aspect of the establishment of a Saskatoon-based architecture program is the recognition of the need for locally trained designers attuned to the community’s history and specific requirements. University Provost Ernie Barber also says the program would create synergies with existing undergraduate programs, such as engineering, that share interests in “creativity, design thinking and visual intelligence.” Last year, a three-part symposium was held to discuss how a professional architecture program might be structured. Barber notes the difficulty of creating a new program and locating the necessary funding—especially at a time when his university is dealing with financial constraints. Despite the slow progress, optimism remains high. He is partial to the proposed downtown location, which would help revitalize an industrial zone. Should this project be realized, the school could very well form an important link between community regeneration and campus development. Architectural education is a dynamic entity that is constantly expanding beyond set curriculums, fixed locations and traditional disciplinary boundaries. In Canada, individual schools are striving to develop visions of the future of architectural education—embodied by building forms with strong links to their context. For all of these new and proposed buildings, a downtown presence offers a certain degree of visibility. More importantly, it opens the door for community connections at different levels, potentially grounding and giving fresh relevance to new curricular developments. The designs already on the boards in Toronto and Sudbury—and the plans underway in Vancouver, Waterloo and Saskatoon—exhibit an impressive alignment of ambition with built form that spells a new era for architectural education in Canada. Tammy Gaber is an Assistant Professor at the Laurentian University School of Architecture in Sudbury.